Few weeks ago, a series of commemorative meetings and photo-taking sessions were held at Telok Blangah Soka Centre (TBSC) to bid farewell to this “first fortress of Singapore Soka Association” – in GD Tay’s words, as it is the first centre built based on member’s sincere contribution and has a significant history. Redevelopment plans were announced as early as July 2011. SSA management justified the redevelopment by citing TBSC’s excellent location and maximizing the use of the land area for the remaining 31 years lease. More importantly, SSA plans to establish a Mentor & Disciple Heritage Centre to be housed in this new building. As the name explains, the purpose of this centre is to eternalize the legacy of the founding spirit of the three presidents of the Soka Gakkai and to serve as a prime point to ensure future advancement of SSA will never depart from the spirit of our Soka Gakkai presidents. Since TBSC was the first centre that we received Ikeda Sensei with his encouragement to us through his comments that it was the “best centre in the world”, it has this important mission to be the anchor point for Mentor and Disciple spirit to emanate brilliantly. Attending these meetings and seeing the numerous TBSC photos on facebook posted by my friends prompted me to pick up the above titled book that I bought last year to read more about Sensei’s visit to Singapore. I felt a great sense of gratitude that such a small country like Singapore can welcome Sensei not once or twice but three times in a span of 12 years! Sensei exerted his outmost in his 4 days here from 8 to 11 February 1988. Despite being tired out after visiting Hong Kong, Thailand and Malaysia, he did his all to open up the path of kosen-rufu here in Singapore for the sake of the members. 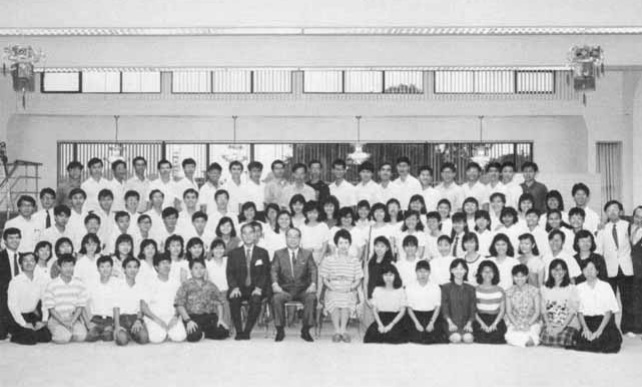 From visiting the former PM Lee Kuan Yew to the various activities by the delegates including visits to People’s Association, Community Chest and National University of Singapore, Sensei hopes to deepen their understanding of SGI and thereby, clear the path in the different arena in Singapore for Kosen-rufu to advance limitlessly. In Buddhism, the three powerful enemies are bound to appear when kosen-rufu advances. But through the actions Sensei had taken, I truly felt that he wants to shelter and protect us members from persecution arising from the three powerful enemies. A special meeting was also held on February 9, 2012 to commemorate the 24th Anniversary of Singapore Kosen-rufu Day. Within a short notice, efforts were made to gather back as many members who were there 24 years ago, with the majority portion of the hall filled by SD and FD members. The various speeches conveyed the message that SSA seniors are determined to promote Sensei, preserve Sensei’s legacy in Singapore and make Sensei’s spirit of Shakubuku their prime point. Viewing through the photos in the book, I realized even the dragon decoration for Chinese New Year this year at TBSC resembles the dragon that was done to welcome Sensei in 1988. This much effort was put in to mimic the details of the 1988 visit. One glaring photo caught my attention! In the photo, Sensei planted a pomelo tree to commemorate his visit. Recalling that I have never seen nor heard about this tree in my years of practice, I enquired about its existence. A senior answered my query by stating matter-of-factly that at a point in time, the tree could not be saved and had to be chopped off. My question that followed was why a tree of such significance was left to deteriorate to a state that it was beyond salvage? If the pomelo tree, the legacy of Sensei’s visit left to us, is not precious enough for us to nurture as an inspiration for future generations, are we fit then as disciples to talk about preserving Sensei’s legacy in Singapore. My further research leads me to even more shocking discovery. Not only was the Pomelo tree chopped down, the entire landscaping created during the time of Sensei’s visit was totally destroyed including the flowering garden consisting of unique 2-coloured red-yellow frangipani , the waterfall pool and the traveller’s palms to screen the building from the west setting sunrays. Only the rock formations and the yellow cane palms that lined in between TBSC and the Shell petrol kiosk remained. Obviously, the entire landscaping including Sensei’s tree was totally neglected. Isn’t maintaining a beautiful garden to welcome the members to the then Singapore Culture Centre, not important at all? A new tree had been planted by former GD Ong in replacement and careful instructions were given to take care of the tree. Would this tree be chopped down during the redevelopment, or will it be preserved to “inspire” the future generations of our beloved General Director? With the pomelo tree gone and the physical building going soon, the beautiful stories of Sensei’s first visit will also be buried together with the rubbles. How then will the upcoming Mentor & Disciple Heritage Centre eternalize the legacy of the three founding presidents and become a prime point for future generations? What is left is a new building more beautiful but with no sentimental values and whatsoever to remind our future generations of our mentor’s first visit. Train yourselves today and again tomorrow. Live, as you boldly train yourselves again today! 24 years have passed since then. Dashed ahead – have we?